We’re finding planets left and right. But so far, nobody interesting to talk to. 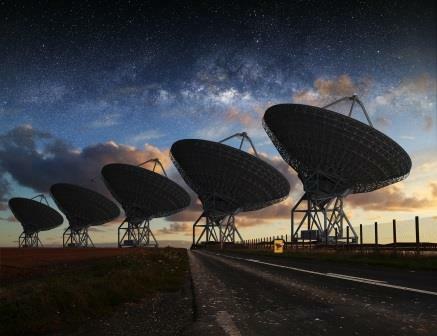 Still, the Search for Extraterrestrial Intelligence (“SETI”) continues. I see SETI’s fundamental outlook as something like this: “With all that space out there, there must be others capable of at least broadcasting in frequencies we can detect.” Imaginations can run wild with that assertion alone, and giddy anticipation of true communication quickly follows (at least for all us nerds that grew up in the shadow of The Day the Earth Stood Still and other timeless SF classics). But the more likely benefit of searching is a little more practical: We might learn something of value. But what are the chances we’ll find something? We can guess. But that’s all. Because actually, we have no clue. The answer depends entirely on what we don’t know. So how do we think of that? But that is because we tend to be a little full of ourselves. Fortunately, we can look back and learn from the mistaken viewpoints of the past. From Aristotle to Ptolemy to Newton to Hawking, every time a genius comes around, we feel like we’ve been given the keys to the kingdom, and we almost know everything. That’s psychology (or maybe sociology), not fact or science. And the lesson of the past, wherein the knowledge pie chart looks like the one above, is that there is a whole lot more in that beige zone than we imagine. So we listen. If humanity is still in its technological infancy (which it probably is), then probability is high that anything we detect will originate from something more advanced. It might be hard to recognize. It could be tough to understand. It may also be horrendously dangerous (probably not). But there’s gold in the sky, and we’re looking for it. Gallery | This entry was posted in Science, SETI and tagged Aliens, Carl Sagan, science, SETI, technology. Bookmark the permalink. There in lies the problem. As a species who’s only just discovered communications in the EM spectrum, two questions arise. First, the universe is billions of years old, and the chances of any other cosmic civilization is at or near the same level of development as we are is infinitesimally small. As a conservative comparison, what contrast is there between the development period of 150 years and 5 billion years? Of all the other possible civilizations existing in the last 5 billion years, what possibility they would occupy the same (or comparable) level of communications technology as to us? The answer is: 1 in 33.33 million. Given how limited EM signals are as a means for cosmic communication, and whereas the rate of advancement humans have progressed within EM signal technology (in only 150 years), what possibility would there be any civilization out there currently using our antiquated communications methods? To that comes the second question. If we were to find an EM signal in use, would you want to make contact with such a civilization? Think about this for a moment, if we recorded a signal from a system a thousand light years away, could we reply? Perhaps a better question would be; would they listen for our reply? There’s a more fundamental consideration at play here, and that’s to do with sustainability of an advanced civilization. In the cosmic arena, the level of sustainability of a civilization is directly proportional to the advancement of said civilization. For as a matter of cosmic truth (entropic adaptation), no unsustainable civilization could ever reach an advanced level without first surviving their own sustainability methods. One is the result of the other. With that firmly understood, communications with a civilization through EM signals equates to communications with an unsustainable civilization — as one who’s not progressed beyond the recognition of the need for sustainable much less feasible cosmic communications. For those who would like this boiled down: Any civilization using EM signals for cosmic communications would be on par with our current level of advancement. If we ever met, a galactic war would result due to the absence of civility. We as a species still fight with ourselves out of fear and narrow vision. We simply have not the social intelligence to resolve our own conflicts much less behave ourselves in the presence of a cosmic equal. No, if you want to find a civilization capable of being detected (out of the slightest amount of self-respect), look not to how we communicate now, but to how they might already communicate — as a basic measure of worth to those finding it (right of passage). To not recognize the rate of advancement within our own study of EM signals would be a galactic insult to those expected to still use them. How short sighted the entire concept is in seeing the galactic elephant in the room. Astute observations. Thanks for commenting. The Fermi Paradox touches some of these ideas. Given the age of the universe, there are some big questions. While it is generally not possible to know what we don’t know, it’s worth the effort to speculate and project. Also, our species certainly has shortcomings. I’m guessing others do also, although the shortcomings might be entirely different. Still, I remain optimistic that we’ll find our way, regardless of what awaits. Optimism is what keeps us forging ahead. Unfortunately, this guarantees nothing to the survival of our species. The level of life recognized by the social constructs of our modern societies is but a narrow slice of the human existence. Were it to become apparent that the social intelligence of a species is responsible for the viability of said species, greater optimism could be afforded. Sadly, the architecture of our societies are built on the fear and legacy of our predecessors — never allowing the global human organism to evolve — as though the past is somehow more important than our future. Do the impartial comments of a physicist qualify only for deletion?